​In the classic novel, White Fang, Jack London tells the tale of an abused half wolf-half dog who finds safety and companionship in a kind, benevolent master. The wolf-dog returns the kindness with an unerring devotion and loyalty, even offering his life to protect his new-found savior from harm. For years, I thought about what it might be like to own a wolf-dog like White Fang. London's hybrid between nature and the common dog proved one magnificent animal—smarter, stronger, and more loyal than any ordinary dog. He was a super-dog, the ideal companion. ​Is a dog a degenerate wolf? One consequence of domestication is that while domestic animals retain all of the same behaviors as their ancestors, the extent to which they show the behavior varies. For instance, wolves and dogs have prey drive (which is why dogs chase cats) but the prey drive has been tempered or modified in domestic dogs. So, while tripping and squealing in the presence of a wolf could trigger the prey drive resulting in a fatal bite, the same in the presence of most dogs is more likely to just result in a startled dog. On the other hand, prey drive in the domestic dogs has been refined so that dogs can work with humans—such as by herding sheep or retrieving hunted birds. If you visit a zoo or park, such as Wolf Park where wolves have been hand-raised, you may find that the wolves are so well-adjusted to being around humans that they may come running from across the field to greet the staff and solicit petting and, under supervision, they sometimes greet visitors both on the property and in other educational events. Even in this setting though, it’s clear that they are far from domestic dogs. With their strong prey drive, they hone in on infants, children, and other squealing or erratically moving objects. They show this interest with a smile and a dog-like wag which fools many observers into thinking they're friendly with children when it's lunch that they're happy about. Wolves in captivity are also different from those in the wild in that they are not in family units, where the parents are the highest ranked because they are the most experienced and their offspring just defer to them. So, in captivity, the desire to be high ranked in a mixed pack is quite high and wolves are frequently looking for opportunities to overthrow those who are ranked above them. In fact, taking a high ranked wolf out of the group for a prolonged period (such as a day or two) can lead to increased fighting amongst the others and possibly fighting when the wolf is reintroduced. The wolves are also less accepting of other individuals and even more likely to be reactive if an individual they know acts oddly. As a result, even veteran wolf-handlers have to be careful around the wolves. At Wolf Park, even routine interaction with the wolves requires two people present for safety reasons. Additionally, when sick or on medications, handlers do not go in with the wolves. Even a wolf's favorite person can be the object of aggression if he is sick. Wolves are also more curious and interested in problem solving than dogs, which sounds good at first, but while the combination of the two is good for survival in the wild, it just leads to mischief in the home. Wolves explore everything with their teeth like little children explore with their hands. Everything they're interested in they rip to shreds, even if it's the couch, the wall, or a table. So, a wolf in a house tends to lead to a demolished house. And a wolf in a house isn't there for long since their persistence makes them wonderful escape artists. Most wolves must be kept in a fenced area with 6-foot fencing and a wire overhang, plus a double door. Of course, there are some exceptions where wolves and high content hybrids are great with children and their owners, especially when they are young. Prey drive may not start to develop until the wolf is 6 months old, and social awareness and the use of aggression to attain high rank in order to have priority access to resources does not mature until two years of age. The instincts can suddenly “awaken” giving the owner the impression that the hybrid is suddenly acting out of character when it's just finally maturing. ​​Does the black spot on your Labrador's tongue mean he's really a Chow mix? That mixed breed puppy in the shelter with a partially black tongue -- is that a sure sign he's part Chow? 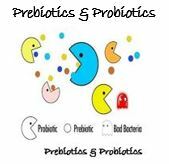 There is often a lot of confusion as to the difference between a Prebiotic and Probiotic and what each of them do.